Lightly tinted moisturising lotion protects skin from sun and absorbs excess oil. A lightly tinted mattifying moisturiser. This super-light anti-ageing moisturiser with SPF protection minimises shine by absorbing excess oil. A gentle mineral-based sunscreen and potent blend of antioxidants protect and fortify the skin. The sheer tint and soft matte finish make it the perfect makeup base. Whilst this is a great mattifying moisturiser on my oily T-zone and doesn't leave me greasy after using it, the tint is a bit of a let down. I have some dry areas on my cheeks and around my mouth and it just seems to cling to them and highlight that they're there. This is a good moisturizer, I have combination skin and it does leave my skin a little bit oily but I fix that with a powder afterwards. Lan - Great for Rosacea! For any one who suffers with redness, sensitive skin or rosacea this sunscreen is a must have. Any sunscreens that contain a chemical filter really irritates my skin so this being mineral and not leaving a white cast is fantastic . Also the tint really helps to tone up skin and fade redness without looking like makeup. The tint is on the paler side but it blends easy and sets really helping to combat shine and oil. I enjoy using this product daily. I ordered a sample of this product to make sure it was the right one and, after a lot of trial and error, I thought I had found the perfect SPF for my oily skin; a matte and smooth finish with a nice colour and zero white cast. But when I purchased the full size bottle, my skin started to react really badly. The first day I noticed it quite dry. The second, a slightly uncomfortable itchiness. And by the third day, the itchiness came with irritation and a burning sensation that took me almost a week (and some very gentle and soothing products) to get rid of. Nothing visible or any redness, but a very uncomfortable feeling. I’ve been using Paula’s 1% Clinical Retinol and the 2% BHA Exfoliant and I’ve never had any issue. In fact, they are both doing a great job so far. But unfortunately, there was something in this product that was reacting really badly on my skin. This is even more disappointing since the price was more than what I would have paid for an SPF, but I thought it was going to be a good investment based on the sample I tried previously. Customer Care: We're sorry to hear that this product wasn't suitable for your skin. We will contact you by email to discuss other options & our return policy. If this came in an untinted version I would were it everyday! Beebo Baggins - Im genuinely shocked! I’m so amazed by this. I had no idea it was tinted until i opened the sample and saw it. When i put it on my skin it felt almost difficult to move around my face. But when i did, wow, my skin looked better with it on that without. I kept checking on my skin because it felt odd? Ive never experienced anything like it. But know i know that was because its a mineral moisturiser which acts differently to standard moisturisers. But to me, my skin felt tighter and drier. I have extremely oiley skin and im 40, i still gets spots daily and this has impressed me so much with its ability to keep it in check that i’m 100% buying a full sized bottle. I'm likelier to have an adverse reaction with facial sun-protection products containing synthetic sunscreens. The zinc oxide protection in the Resist Anti-Aging Moisturiser is gentle and effective. There aren't many good mineral sunscreens with antioxidants and skin-soothing ingredients are on the market. This one is outstanding and fragrance-free as well. Mineral sunscreens often feel drying on my face. I must prime my dry skin with a little moisturiser following cleansing, toning and exfoliation prior applying this sunscreen. I use other good mineral sunscreens but I'm not comfortable without having this one in my drawer as well. I love most of the PC products but this was very disappointing. I’ve stick with it for two weeks but really can’t get on with it at all. It leaves a horrible tacky feel to your face & the colour is awful, I’ve had so many people asking me if I felt ill! I won’t be buying this again. I really wanted this moisturizer to become my holy grail daily moisturizer -- I am a PC devotee and it had everything I was looking for: SPF, shine control and even a bit of tint. It smoothed out my complexion, and it blended well with a drop or two of foundation if I wanted more coverage. Unfortunately, I hated the way it felt on my skin. It left my skin with a greasy, slightly tacky feel and the color transferred easily to clothing or my hands if I touched my face at all. I tried setting it with powder, but it didn't make a noticeable difference. The mattifying effect also wore off after about 4 hours. I was constantly aware of it sitting on my face, the way I used to feel about older-generation foundations, and I couldn't wait to get home at the end of the day and wash it off with an oil-based cleanser. I never tried it in humid weather but I imagine the effect would be even worse. I'm switching to the Clear Ultra-Light Daily Hydrating Fluid, which has a better mattifying effect for my oily T-zone and doesn't have the tint. Disappointed with this one, especially given the price. I’ve tested a multitude of sunscreens over the years, and after using this every day for the last 6 month, I can safely say it's by far the best I’ve tried. I would highly recommend this to anyone with oily skin – it’s the only physical sunscreen I’ve found that doesn’t make my skin appear greasy, and doesn’t cause breakouts. In fact, it seems to keep the oil at bay throughout the day. I always apply a generous amount for optimum sun protection, and this still glides on easily, drying to a soft matte finish. The tint evens out my skin tone beautifully (although it is just a smidgen too dark for me) and on good skin days, I’d wear this on its own. But it’s also a fantastic primer under makeup and makes it last longer too. I prefer to use this as a sunscreen over a water-based moisturiser, which seems to prevent any potential dryness. In fact, I’m currently using medication which has made my skin go from oily to very dry, and I’m still able to use this SPF without any problems. All in all, a wonderful product and I’m so glad I found it! I've been using Paula's choice products including the resist spf30 for over a year now. I was at my lowest point having used a makeup product that catapulted my skin into a severe reaction where literally NOTHING would bring it back to calm. I've always had good skin so I was at my wits end. After researching products that didn't contain any aggravating ingredients I came across Paula's choice products. I bought the calm range.... not only did my skin return to normal within the week I started using them, I noticed about a month on that my skin had jumped to a new level!!! I am such a fan of these products that I swing from wanting to tell everybody to wanting to keep it my little secret. I am now glad I had my bad reaction because otherwise I would never have had the good fortune of finding my perfect skin care. 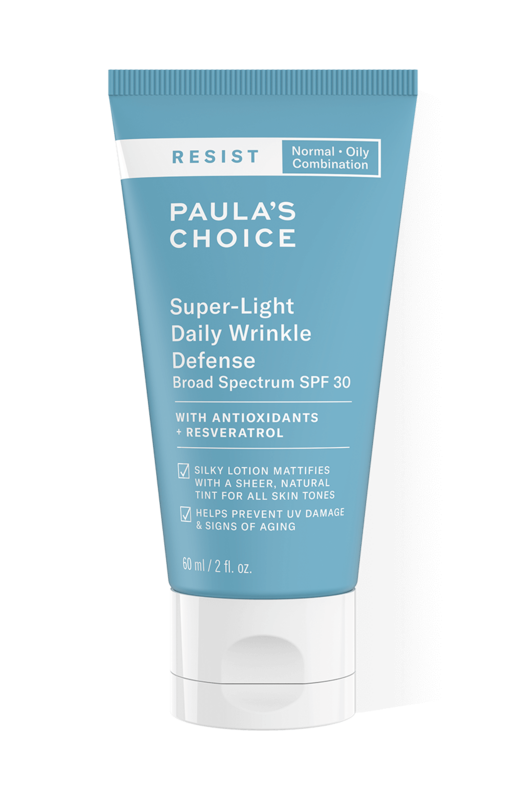 I've been using Paula's choice products including the resist spf30 for over a year now. I was at my lowest point having used a makeup product that catapulted my skin into a severe reaction where literally NOTHING would bring it back to calm. I've always had good skin so I was at my wits end. After researching products that didn't contain any aggravating ingredients I came across Paula's choice products. I bought the calm range.... not only did my skin return to normal within the week I started using them, I noticed about a month on that my skin had jumped to a new level !!! I am such a fan of these products that I swing from wanting to tell everybody to wanting to keep it my little secret. I am now glad I had my bad reaction because otherwise I would never have had the good fortune of finding my perfect skin care. Amy Beth - Love this! I have been using this moisturiser for three months now and its doing a great job. I was using three different moisturisers together to try and combat my combination skin, now I no longer need to as I no longer suffer any dry patches. The only thing that hasn't changed is my oily chin. Overall I am pleased and it has made a positive difference to the condition of my skin. I honestly love this product and I don't know where to begin telling people! I would start by thanking Paula's Choice skin care for the massive improvement to my skin and now my skin looks that much healthier with no breakouts I wear this moisturiser as a sheer foundation! As it has slight foundation colour in the product to help reduce that shine/flash back from the Sunscreen ingredients I can now get away with wearing this for those days when I can't be bothered to wear make up. It's light weight texture leaves my skin blowy but not oily as it sinks into the skin immediately but doesn't leave it feeling right or dry. I've been using it everyday for over a year now and I'm probably on my 3rd bottle. I have bought a lot of moisturisers, drugstore and high end, and honestly this is the best one I have come across! Love this product, super light never makes my skin shiny and has a slight tint so i dont have to apply foundation if i dont want to. I would absolutely recommend this product it does everything it says on the tube!!!! I normally buy the youth extending moisturiser but wanted something a tad more matt. This is definitely very matt. I have black skin (NC50 for reference) and this 'natural tint' that is supposed to work for all skin tones leaves a grey cast which is visible over make up! Absolutely awful! Customer Care: We are sorry to hear this wasn't a match for you! I bought this to wear as a daily moisturiser as it has spf30 and I have combination skin which is starting to get fine lines. The consistency is good but it dries to a super matt finish and left my skin feeling really tight. The finish was so matt that my fine lines showed up even more especially when smiling! I think if you have very oily skin it might be okay, but for me with oily in the t-zone and normal elsewhere it was far too drying. Customer Care: Thank you for your feedback. We are sorry to hear of your experience. Unfortunately, not everyone reacts in the same way to skin-care ingredients, and some can be more sensitive to a particular ingredient than others. Even the symptoms of sensitivity can be different from one person to another. We will contact you to discuss other options. I'm very pleased with this product. However, for my dry cheeks it's simply not hydrating enough. I have to combine it with the booster to keep my skin hydrated over the course of the day. I wish PC would develop the exact same moisturizer for dry skin. I'd also like to address previously mentioned concerns: For me the moisturizer works just fine around the eye area, although it sometimes is a bit difficult to have it absorbed, so a lot of very gentle rubbing is necessary, which might not be ideal for any impatient people. Also, even though I have a full beard, I don't have any troubles with absorption around my beard area. I also can't make out any residue as has been previously mentioned. Overall, it's a great moisturizer, also for a beard and the eye area; that doesn't leave the general sunscreen shine on your face. The only downside is that for people with very dry skin it might not be moisturizing enough and an additional booster may be necessary, which sort of feels like PC trying to get me to purchase two products when one should really be sufficient. This moisturiser not only has a SPF30 protection for when the summer hasn't totally come in, but also has a slight tint to avoid flashback from camera's if you want to use this for night time as well. It melts into my skin in minutes and doesn't leave a tacky texture and doesn't effect my primers performance (NYX Angel Veil) before foundation application. Without this moisturiser my foundation and overall make-up after 6 hours looks dreadful.... Oily in my T zone severely and cakey on my chin and upper lip which I then have to salvage by using oil blotters and a dry beauty blender! AND we cannot forget this moisturiser and Brand are completely cruelty free!!! This is why I LOVE Paula's Choice products. I have tried so many sun creams and none of them suited my skin,but this really did.It absorbed really well no shine at all and helped keep my makeup shine free all day.I will definitely repurchase this. I have combo skin and hate tinted moisturisers to death -- no matter how well I exfoliate they have always sloughed off and make me resemble a lizard person shedding my human costume. Sunscreens also have given me a white, slightly greasy cast, and considering I'm also prone to red rosacea-like glows this makes me look like an embarrassed ghost. Hated this too when I first put it on -- it looked chalky, far too dark and just kind of weird -- but after ten minutes I had the kind of matte, even skin that usually takes me ten minutes of full face cover to recreate. Feels silky, stays put while I am exercising, doesn't clog, doesn't settle into my lines. This product is a godsend. I don't even bother with foundation now most of the time, albeit it's a great pre-makeup cover -- everyone has been complimenting me on how great my skin looks. I bought a second bottle just so I don't have to have to deal with any transition time once the first runs out. I went to a wedding recently wearing this without any other foundation and my skin looked perfect the whole night, no face-of-molten-slap syndrome by the end. The ultimate tinted SPF. If they only started selling this in bigger bottles, I would be the first one there, throwing fistfuls of money like the Monopoly man. When they say that this is light, they are not joking - it really is. I find that mineral sunscreens can dry out your skin, and this is no exception - even though i have combination skin that is acne prone, this can still leave me feeling dry if my skin is going through a "drier phase" but i'm not rating it down because I still haven't found anything that is better AND my pale skin loves the tint that this has! On really good skin days, not that there are that many, I could even use this as a light tinted moisturiser all by itself and if i wanted extra moisture i think a serum underneath would really solve the issue. I've repurchased this twice now, and that is not something i'm prone to doing with products since i'm always wondering what's better and what's new, but this is just a staple wonderful product that i keep coming back to. If you have dry or dark skin you probably won't like this at all, but for me I really love it. Purchased this due to great reviews and for oily but really did not work for my individual skin. The tint is fine for men and women of all color as when you actually apply it, it looks like every other moisturizer and leaves no color. Its also good as it has no white cast, which is good and unlike every other Mineral/Physical Suncreen. But it was extremely runny. It's easy to waste product and it felt like something was sitting on my face it was horrible. Didn't adsorb well at all. Made my skin itch and irritated. My skin didn't feel smooth at all, it left a chalk like feeling consistency on my face, even on my hands when I touched it. It felt like I had make up on, not because of the tint but because of the feel and texture on my skin that didn't go away. Good Sunscreen as there is no way the sun will get through this and fine for women who are used to wearing make up, but due to the texture I would not recommend for men at all. Very disappointed. I would recommend the Skin Balancing SPF which is amazing for oily skin, also has no white cast and is cheaper which I am gonna try and exchange this for. I'm a 26 year old male with oily skin that is prone to break outs. I've never used a Paula's choice moisturiser or a SPF product on the face regularly, but after I heard in a study almost 90% of visible skin ageing can be the result of everyday skin damage I decided to use SPF daily. I chose the light moisturiser because I use a face oil in the day and didn't want anything too heavy as I have oily skin naturally anyway. First thing you notice is the colour, it comes out looking like a BB cream in lightish foundation colour. It doesn't have any coverage really but when I applied it I noticed a warm hue to my skin tone that was probably more noticeable because my skin tone is very fair (redhead fair!). I don't mind this because I like having a warmer/sun skinned look but for anyone who is very pale and likes it that way this might be a problem for you. Applying it a little goes a long way and it feels very lightweight and non-greasy, which I was concerned about considering my experience of the regular SPFs you use on holiday which make me breakout on my face. Also surprisingly very mattifying! I've been back from the gym after sweating and my face doesn't feel oily or look shiny look like it normally does but looked and felt like I just applied it. Overall in the short time of using this product I love it, only downside is it's smell as it still reminds me of the smell of sunscreen I normally use although for a product with 100% no fragrance this is a small compromise I am happy to accept. Great product! When I first tried this product I was a bit disappointed; being a male I found the tint too much like a foundation. I also found it to be too matt. I prefer a more silky finish, however i did like how it felt on my skin. I decided to blend it with my favourite moisturiser Paula's Choice Youth Extending moisturiser. Wow I was so pleased with the finish and colour! Just perfect! This blend is my "go to" moisturiser and if I coul, I would rate this combination 6 stars out of 5!!! Guy - Irritating and sticky. I am a HUGE Paula's Choice fan, and there are many products that I now utterly swear by - the 2% bha liquid, the 10% aha treatment, the resist advanced weightless toner, the retinol serum, and the clinical 1% retinol treatment. I bought this Resist Anti-Aging Super-Light Daily Wrinkle Defense SPF30 to use as my daily moisturiser as I use retinol every night and really should be protecting my skin with an spf moisturiser during the day. My skin is combination, prone to clogged pores and very occasionally a little dry, but not at all sensitive. I ordered this and have used it five times now, each time I found it difficult to apply (it really does have a chalky skin-toned tint, which is absolutely fine on my pale skin but might be a problem with a tan), the colour is extremely natural and suitable for a guy who doesnt want to look like he has any make-up type effect, EXCEPT that it clings horribly to my dark brown short beard/long stubble, making it look ashy and makeup-y. I wear makeup sometimes and have no worries about doing so, but this just looked horrible near facial hair. This isn't an inherent failure of the product, but is definitely something male customers or those with dark eyebrows might want to be aware of. The other, and main, issue I had with the product is that it offered no moisture whatsoever - my skin actually feels drier with it on, and it dries down leaving a horrible sticky, tacky feeling all over my face. I've tried it with an additional light moisturiser underneath, but didn't see much improvement, and wouldn't want to have to pre-moisturise before a moisturiser anyway. It also, due to its suncreen content, has quite a pronounced smell - whilst it's not totally unpleasant, it is noticeable for several hours even after I have applied a fragrance (as someone who is a fragrance nut, this was also an issue as it fights with whatever scent I am wearing.) Regarding the dryness it creates, with the product on my face there were tiny flecks of dry skin that were either caused by the product, or made visible by it when nothing else does - my skin, due to the other PC products I use, normally looks very clear and hydrated, with no dryness whatsoever. In addition to dryness, also makes my face feel very irritated - I kept looking in the mirror expecting it to be reddened and visibly irritated, but it was just the sensation without any visible effects. Given that it's a physical sunscreen I expected it to be gentle, not irritating. Given the plethora of excellent reviews of this product, I am clearly in the minority but it's truly awful on my face, which as I've said is somewhat of a shock given my experience with everything else I've tried from PC and the fact that my skin doesn't get mad with almost any products ever. Definitely try a sample or two, as I've completely wasted my money this time. Customer Care: Thank you for your review. Although this is not a common response, we do understand that each customer is uniquely different in how they will respond to products or ingredients. We can see that our customer care team has already provided you with a reasonable solution. I cannot fault this moisteriser. I tried a sample because a colleague of mine recommended it, and after trying it I just couldn't go back to my old skin care routine. It feels soft and smells nice when applying, sinks into skin quickly and acts as a perfect base for foundation and leaves you looking refreshed and plump if you choose not to wear any (I actually have the confidence now to go out without ANY foundation on as this acts as a BB Cream would). People have even noticed how fresh I look now and comment on my skin without knowing why I look different. As you can tell I LOVE this moisteriser and would recommend it over and over. I'm only my second tube as I apply this on top of a moisturiser and it's lasted about 6 months! Great for those on a budget. I've found it to be a really good product, but it could be transformed into a truely great all-rounder if it were made in say, four different shades, and not just the one. It does even out skin tone and conceal minor blemishes, so acts like a very lightweight tinted moisturiser as well as a straight forward moisturiser with a good SPF. I really like this aspect and think it could be capitalised on by adding a choice of shades. Personally I would like a more yellow, rather than pink tone to it as my skin is light olive. As it is it's still a good product that definately leaves a no shine matte finish. It's a little dry in the winter, but that can be remedied by applying more, or a different moisturiser underneath. It's a very natural looking product, but having said that, in the shade it is at the moment, I can still see a very faint white cast when viewed from the side, or at an angle. It's also one of the few skin care products that doesn't irritate my eyes - which is the biggest problem I have to overcome in my choice of products. Customer care: Thank you for your feedback. The purpose of the tint in this sunscreen is to prevent the white cast usually caused by mineral sunscreens. We're happy to hear you like it. Katrin - The best tinted spf! What an amazing find!!! I ordered PC's Resist sample kits to try out some heavy-duty AHA, BHA and Retinol treatments, and this product, completely unexpectedly, almost stole the show! Well, I love the exfoliants as well, but in a way I had already given up on my search for a perfect 2 in 1 SPF product after trying countless BB and CC creams, sun protections lotions, fluids, oils... I'm not overly picky, all I want is minimum 30 spf, has uva protection, and doesn't make me look white as a ghost, or oily and orange as fried chicken. I've literally wasted 100s and 100s for high-end and high-street products, all of which either make my skin break up horribly, are too oily to wear alone and too oily to layer anything on top, or have unnatural orange, pink or grey tint. And I can't go out without spf as even 10 minutes gives me sun spots. Now, i may have finally found my perfect spf! With perfect peach tint, its matches my nordic skin perfectly. Since you're supposed to use half a teaspoon of spf cream for face to have a decent protection, this is actually also more moisturising that I expected, and with colder weather, I can just layer it on top of usual moisturiser. Genius product, thank you! Charlotte - With promise but didn't deliver. I am SOOOOO disappointed with this product!!! I've been a fan of Paula's Choice and I thought this product had all the making of something I was going to love particularly as the ingredients are really highly thought of and I invested a lot of research into exactly the product I wanted to purchase. I'm sorry this product was a real let down... the tint looks awful on my skin and I have never experienced acne break outs like this for years!!! As soon as I started using this product I can link it to all my new angry spots. I've wasted my money and I'm really disappointed! Customer Service: Thank you for your feedback. Although this is not a common response, we do understand that each customer is uniquely different in how they will respond to products or ingredients. We will be contacting you shortly by email to discuss an alternative product. More of a personal review of products for my own future reference when I come to reorder: I think I have somewhere between normal and Dry skin. Not too dry and not too oily but depending on the weather and season, seems to benefit from heavy moisturiser in the evening and light version in sweaty hot summers. I tried the sample of this SPF 30 thinking that I might use it on very hot days only. Nice light consistency with slight colour (much like a tinted moisturiser), gave my face that ever so slight coverage. Could even build up the coverage with more layers of the same lotion. Like SPF 30 and like the coverage and consistency but probably too drying, even in the hottest of weathers.. is particularly dry on the driest part of my face (naturally!) which are my cheeks and just under the eye area near the temple and above the cheekbone area. But may try a few more samples again when on a hot-sun holiday near the equator. I love this product! It has a light texture and isn't tacky to the touch. There is a slight tint which is perfect for my skin tone and means that on my brave days I can wander around town feeling all proud of myself for not wearing make-up! Although unfragranced there is a slight scent which I find pleasant and not off-putting (even the husband like to kiss my face when I'm wearing it). A little definitely goes a long way although I'd be interested in hearing the required amount to achieve the listed SPF protection. I have recommended this product to my sister and I will most definitely be re-purchasing. Wearing this, although much lighter than traditional SPFs, still make me feel a bit 'caked in foundation'. I feel like I'm getting all the disadvantages of wearing a tinted SPF moisturiser (heaviness on skin, not easy to blend), without the advantages (proper coverage). It leaves my skin feeling tacky for hours as it doesn't soak in well. Having said that, I have no doubt it provides my skin with beneficial ingredients and does a good job of protecting it from the sun, and the tint does prevent any white cast from showing. I have been using this product on a daily basis for a few months now and although the product hasn't blown me away (what SPF products would? ), I haven't had any problems with it; in the past I've struggled to find a decent SPF that hasn't irritated my skin in some way. By far the best thing about this product is the fact that it can be used around the eyes: I've found it really difficult to track down an SPF suitable for the eye-area that doesn't cost the world. My only gripes would be that I would prefer the product not to be tinted - although it's subtle enough for my pale skin - as I feel the colour in the product may dry out the sensitive eye-area with regular use, and as a result I have noticed that occasionally my eyeshadow "drags" a little more than normal when blending it with a brush. Having said that, I would repurchase this product. I don't know how to delete my past reviews but I have to get back on it. I first found the product way too drying but after not using it for a while and hydrating my skin properly I went from a dehydrated dry combination skin to my usual dry combination skin and I us this moisturizer in my T-zone only now and it works like a charm and helps my make-up stay put. It just shows that Paula's Choice's advice to keep experimenting is completely true. Can someone please tell me how to delete my old reviews? Customer Care: Thank you for your review. Great to hear this product works for you now! We have removed the review at your request. Mujgan - The BEST sunscreen I have tried! I absolutely love this sunscreen! I have tried countless sunscreens in my quest to find one I like and can use everyday. I got my 2nd sunburn ever in late September 2014, and realised I had to use sunscreen everyday to prevent future damage. Since then I have tried various sunscreen and hated all of them! They were too heavy, left a white cast and did not feel pleasant on the skin. Especially for someone like me who has oily sensitive skin I cannot stand sunscreen that feel unpleasant and make me shiny! I ordered a few samples of this sunscreen early in my search but didn't use it on my face. Initially after trying it on my hand I thought it was too drying and the tint worried me. Fast forward a few months and I tried it on my face over a gel moisturiser as a last resort to see if I liked it and I haven't looked back since! It is an EXCELLENT sunscreen that spreads like a dream, the tint evens the skintone somewhat and best of all it sets to a matte finish! It doesn't not feel drying at all but I prefer at this winter time of the year to layer it with something underneath. In the summer I'm sure it will be fine to use it by itself since I am oily. I also ordered the Ultra-Light Antioxidant Serum to layer it underneath the sunscreen instead of my gel moisturiser. Hopefully that will be a winning combination that I can use successfully. I also ordered another tube of this just to make sure I have a backup since I love it so much and don't want to be without it ever. I really hope this product does not get discontinued or the formula changed since I think it is PERFECT and my search is over. I plan to use this indefinitely and highly recommend it! I have tried countless moisturisers & spend £££'s on those that promise results & never deliver. I read up on all of the moisturisers & their ingredients (via Beautypedia!) & was stunned about all of the unnecessary additives & minimal "active" ingredients that didn't help my sensitive, combination skin. I thought I'd try this & bought a weeks worth of samples-which is just fantastic to make sure it's right for you before you take the plunge with a full size! Joseph - Great zinc oxide sunscreen but not clown makeup!! Zinc oxide works most effectively for me in keeping oils under control on my skin and also not aggravating my skin as other sunscreen actives do. However I get frustrated that in most skincare products it has such an unappealing application it actually feels like I am applying clown makeup. However, this just combines the best of all worlds it has a high zinc oxide content making me feel safe that I am not going to get UVA or UVB damage but it just applies so beautifully not leaving a white cast (due to the great tint) and also having a great silky smooth texture that I have never before experienced in a zinc oxide sunscreen. Great, great product. I have this moisturiser, mainly for round my eyes, as the under eye area is the only area on my face, at the age of just- turned 50, that is now beginning yo show signs of aging in the form of fine lines. I don't, as yet, use it all over my face, as I am using the clear mattifying moisturiser during the day and the ultra light serum and the hydra light moisture infusing lotion at night. These products, following the clear normalising cleanser, the balancing toner and the extra strength exfoliator, together with the occasional use of the balancing mask, have transformed my skin!! I also do use a benzoyl pentoxide product on the now occasional spot that I get, mainly at a certain time of the month. Where I personally disagree slightly with Paula's advice, is that I still think that you DO need an eye-specific product. I did not find that any of Paula's products helped my fine lines, to be honest. So, I have reverted back to my eye serum and eye cream. This Resist product around the eyes is a bit drying for me. Although, Paula, to be fair, does state that, if your eye area is different from the skin on the rest of your face(which mine is), then you may need a separate eye product. But, all in all, as well as being terrific ant- blemish and acne products, they are also excellent anti- aging products. Great sunscreen, no shine, no white cast. The tint offsets that and as long as your don't use too much it is not noticeable. Great that it is based on zinc oxide and has no titanium dioxide which is more likely to clog pores. I like the matte finish but find it a little too drying so gave it 4 instead of 5 stars but is non irritating. Sometimes you need to wash twice in the evening to get all of it off though. I use this product with my Oil Balancing Cleanser and the super antioxidant Resist Serum. They work perfectly with each other, but my only problem with this is that it is tinted. Not because I'm a guy... I work in the cosmetics industry so I wear make-up on a daily basis, but my only problem is that normally I would just use any excess as a hand moisturiser after applying to my face, but don't if you wear white. I have forgotten on many occasions and wiped my hand on my towel after using this on my face and my towel is left with a huge tan streak down it! Douglas - The best ever!!! Amazing stuff this...It keeps my skin happy all day...I have never had my skin feel this good ...ever! I have suffered with acne all of my life for the most part, since finding Paulas Choice products I can honestly say that I have the odd spot insteadof full acne...and with time Iit seems to be getting better and better. The colour of this product is perfect for me...Once rubbed in it dissappears and leave a near matt finish, perfect for us blokes! I can't recommend this product enough! Many thanks! And once again...PLEASE DO NOT CHANGE THE FORMULA...IT'S PERFECT! This SPF moisturiser feels wonderful on my skin. I ordered it to use under foundation but am so delighted with the smooth, even finish it gives - matte, even on my t zone- that I can actually go without foundation make up! Love it! I have never managed to find a moisturiser which didn't make me break out, and finding an SPF one was even harder as they tended to be very thick and gloopy and much too rich for my skin. I also try and avoid chemical sunscreens as I have quite sensitive eyes and find that they cause irritation to them. I was kind of shocked when I first tried this moisturiser as it seemed quite heavily tinted - it looked very much like a foundation - and looked quite rich and creamy - I was sure it would look very obviously like makeup on my skin, and also that it would be far too rich for my greasy skin and make it break out. However, having applied it carefully according to the instructions - what a revelation! At first it did seem like it left a slight cast on my face, but it spread beautifully and once it had sunk in, after a few minutes I was amazed - my skin looked great! Glowing, even and very soft and smooth, but it didn't look obvious and it even smoothed over my chin, neck and cheeks which I normally have a problem with as I have a heavy beard. As a bonus the tint make any spots or red areas look a lot less noticeable - they didn't disappear completely but looked much less red and less obvious, and I didn't feel I looked like I was wearing makeup or foundation. Best of all, I have used it right over my eyelids and under my eyes and it hasn't caused even a hint of irritation, so it's great to know my delicate eye area has SPF protection without irritation - that's some achievement with how sensitive my eyes are! I've had lots of comments on how good my skin looks, and I've been using it long enough now to realise it won't make my skin break out. I even quite like the smell - like all PC products it's unfragranced, but it has a slightly biscuity smell which is quite pleasant. I have a slightly olive complexion and find the shade just right, but after a few minutes if you rub it in properly, it really does seem to disappear so I think it would suit the majority of skin tones except maybe very fair or very dark. I don't give it five stars for three minor reasons - one, I was surprised that although my skin does feel smooth and soft after application, it also feels ever so slightly drying - this may just be the unfamiliar sensation of the mineral sunscreen, and it's only very slight, but I was still surprised a Resist moisturiser product didn't feel just slightly more hydrating. Secondly, I find it a little hard to wash off - even using a PC cleanser, I need to wash twice and even then get a little of the tint on the cotton pad when I use a toner. Perhaps I am using too much - but I don't want to use too little and not get the sun protection I need. To be fair Paula's Choice could help more - on her products she tends to refer to "nickel-sized" amounts but we Europeans don't use nickels so I'm not sure how much that is! Finally - the price. I accept that PC has to comply with EU cosmetics regulations and that we pay extra taxes etc. here but I still feel that at almost £30 for a small tube, this is very expensive. Complying with EU regulations is a one-off cost - once the formula is adjusted that's it - and European currencies are generally stronger than the US dollar, which helps offset import costs, so I don't entirely accept that the higher price I am charged in the UK is truly justified compared to the US price. It's worth it, and I'll continue to use it, but it means I can't afford to buy other PC products I'd like to and have to prioritise and just buy a few key products. I am sure a modest price cut would be more than offset my better sales. If it were very slightly more hydrating, was easier to wash off and cost a little less it would be perfect - and to be fair the first two problems may be caused by my using too much (any feedback on this would helpful bearing in mind I want to keep the SPF protection effective), it would be perfect. As it is, it's still an excellent SPF moisturiser and the best I've found to date - I'll be ordering it again. Erica - Not for dark skin! Was very disappointed with this moisturiser. i bought it as I was looking for something that contained resveratrol and some of the other key ingredients plus sunscreen for the day time. Was very excited to see it said it was perfect for all skin tones with no white cast. That has not been my experience. I've had this for several days and tried using it on dry skin, damp skin and left to absorb for several hours and my face is left looking ghostly grey. Really wished it had the sunscreen formula used in the Skin Balancing as I still really like the other aspects of this formula which is why I gave it 2 stars. This does exactly what it says on the tube. For what more could one ask? It actually firms my skin, who knew that was possible? It leases my oily face matte all day long and I can use it right up to the lash line so I'm protected all over. Weirdly, I also adore the smell of this product; I'm aware it's not fragranced but the combination of ingredients smells divine, like so many PC products. Finally, a sunscreen with which I am entirely happy. My husband called me 'carrot face' when I wore this. As others have noted, it really does turn some of us orange. However, thanks to the review below, which was most helpful, I have ordered the hydralight moisturiser and hope by mixing the two I can arrive at something which works. After years of searching for a facial sunscreen that doesn't leave an oily residue or cause irritation, I'm glad I found this. Upon application it feels like a skin treat rather than a regular sunscreen. It glides on setting to an even, healthy look. My skin looks rested and even toned. It's great to know I can finally wear sunscreen every day and hope that my brown marked skin appreciates it in the longer term. Rachel - Shame about the tint, it's too dark! I'm another one of the growing army of pale people who cannot use this sunscreen by itself, because the tint is way way too dark, and the tone is pink/orangey, so not good at all. I mix it about fifty fifty with the Hydralight Mineral sunscreen and then the colour becomes bearable, dries out nicely and leaves a lovely matt finish that lasts, and looks very natural too. I wish this was made without any tint of any kind, or at least with a very very light tint, so pale people could use it straight from the tube without having to mix with anything. I actually can't use this product in isolation; the tint oxidises on my face to a vivid orange - I have fair 'level 1' skin - and the texture, though hyper-matte, is a little too drying for my (combination to oily) skin. HOWEVER, if I take a glob of this and mix it with the Hydralight SPF 30 (the latter in about three times the quantity of the former) then I get the most perfect, invisible finish that I've been missing since switching to mineral sunscreens. The Hydralight SPF is otherwise unbearably white for me, and never truly 'sets'; mixing in the RESIST Super-Light, as described, rectifies both of these problems and subtly evens out my skin. The combo washes easily and leaves my skin softer and more relaxed than before the morning application. Best of all (for men), it absolutely does not look like makeup. So, whilst neither the Hydralight nor this RESIST product work for me in isolation, the combination is SO GOOD that I wanted to share my experience. Especially as my skin now benefits from the antioxidant cocktails of both products and, of course, the gentle broad-spectrum UV protection assured by mineral actives. With regard to the cost of these products, as described in the review below, I feel some key points are missing. Firstly, if you are in any doubt about the cost-saving benefits of this UK outlet, I recommend trying to order from the US site; with the standard international shipping and mandatory duty, this product (which I ordered early, with great anticipation) came in about £10 pounds more expensive. So if you wish to use PC products, this website is absolutely the cheapest way of doing so in the UK. Second, product for product, the prices here reflect those of department store brands such as Clinique, and in fact are often slightly cheaper. This, before you even consider the variable quality of such other companies in terms of peer-reviewed, evidence-based efficacy. Finally, and this is a huge inconvenience for anyone who wants to use Beautypedia, the EU/UK products from many brands - despite bearing the same names and packaging as their US counterparts - are often completely DIFFERENT (and invariably inferior) formulations. This is presumably a consequence of European regulations. So your UK Cetaphil/L'Oreal/MAC product bares no relation to the US equivalent, and frustratingly is often much worse for your skin. Not so with PC, where you always get complete product parity. dawn - issue with the shade, but love it otherwise. i really love the smooth matte finish of this, no oilyness all day after one application. Makes my skin very soft also and breakout free. Only issue is the shade which is apparently for all skin types! When applying the recommended 1.25ml to my face, this comes up as an orange-pink colour, like the wrong shade of foundation! It is also very heavy like a thick makeup. really does not suit my fair skin. If you were to put a shade in this moisturizer different levels for different skin tones would have been good! That or have it colourless, like the other moisturizers? Was so looking forward to this too! Customer Care: Thank you for your review. Our panel tests for the RESIST Super-Light SPF 30 included those who were super fair (Level 0/Porcelain) to those with deeper skin tones (our upcoming RESIST Levels 6 &7), but we’re sorry to hear this wasn’t a fit for you. Kevin - I'm really dissapointed. I am utterly disgusted in the price you are charging UK customers for this product compared to US. In this US this cost $27.00 which equates to £17 in british pounds.Why do UK customers have to pay £16 british pounds more than US for the same product?!? I understand there are certain EU laws etc but they do not effect price by this much. For example, Cetaphil in the US costs $8ish in the UK it costs £8ish.So why do you continue to try and rip off UK customers.From now on I will not be buying from you again. I was so excited for the release of this product, but no longer will I continue to buy from you until the pricing of the product are moderately the same as other countries. Customer Care : Thank you sharing your concerns with us and we are sorry to hear that are so disppointed in our prices. With regard to your reference to the prices on the website of Paula’s Choice USA, we would like to point out that prices on the EU website include VAT (which averages at 21% in the EU) and that no other import duties or taxes are payable on delivery of the goods. Prices on the website of Paula’s Choice USA are exclusive of VAT (which is payable on importing the goods in the EU) and any other import duties or taxes which may apply. In addition PC Europe has to deal with extra costs to comply with EU regulations and EU testing policies. We hope to have been helpful with this information. and again we thank for sharing your thoughts with us. Potent antioxidant abundant in red grapes and, therefore, in red wine. It has significant skin soothing properties for skin. Aqua, Cyclopentasiloxane (hydration), Zinc Oxide (13%, Nano, broad spectrum sunscreen agent ), PEG-12 Dimethicone (texture enhancer), PEG/PPG-18/18 Dimethicone (texture enhancer), Lauryl Lysine (skin-conditioning agent), Sodium Chloride (stabilizer), Trihydroxystearin (texture-enhancing), Dimethicone Crosspolymer (suspending agent), Resveratrol (antioxidant), Quercetin (antioxidant), Epigallocatechin Gallate (antioxidant), Tocopheryl Acetate (vitamin E/antioxidant), Tetrahexyldecyl Ascorbate (vitamin C/antioxidant), enisonedA (skin-restoring), Bisabolol (skin-soothing), xilaS Alba (willow) Bark Extract (skin-soothing), Punica Granatum (Pomegranate) Extract (antioxidant), Haematococcus Pluvialis (Astaxanthin) Extract (antioxidant), Hydrolized Corn Starch (texture-enhancing/mattifying agent), Polysorbate 80 (texture-enhancing), Hydrolyzed Silica (texture-enhancing/mattifying agent), Triethoxycaprylylsilane (texture enhancer), C12-15 Alkyl Benzoate (emollient texture enhancer), Isopropyl Titanium Triisostearate (texture-enhancing), Caprylyl Glycol (preservative), Hexylene Glycol (preservative), Ethylhexylglycerin (preservative), Iron Oxides (CI 77491, CI 77492, CI 77499) (colorant), Phenoxyethanol (preservative). What is the biggest difference between Resist Anti-aging Youth-extending Hydrating Fluid SPF 50 and Resist Anti-Aging Super-light Daily Wrinkle Defense SFP 30? Resist Super-Light SPF 30 has a mineral sunscreen base, which makes this product more suitable for people with sensitive, oily skin. The mineral sunscreen also provides a greater mattifying effect than the Resist Hydrating Fluid SPF 50. Resist Super-light SPF 30 has a touch of colour to help skin look more even-toned. Resist Hydrating Fluid SPF 50 has a fantastic light texture that is ideal if you have oily, breakout and blackhead-prone skin. Is Resist Super-Light Daily Wrinkle Defense SPF 30 suitable for breakout-prone skin? Yes. Despite containing 13% zinc oxide, this formula was designed so that the zinc oxide ‘floats’ over skin rather than settling into pores - this is accomplished via innovative silicone technology. Is Resist Super-Light Daily Wrinkle Defense SPF 30 suitable for rosacea? Yes. 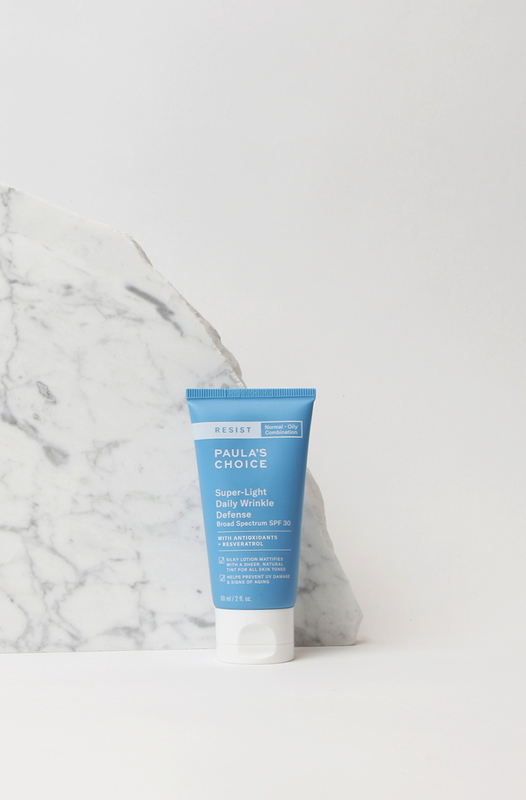 Not only is the formula fragrance-free (like every other Paula’s Choice product) it contains the gentle mineral active zinc oxide plus proven anti-irritants and antioxidants that work to reduce inflammation. When inflammation is reduced, skin appears less red and looks more even-toned.